Welcome to the 2018/2019 School Year at South Orangetown Middle School! 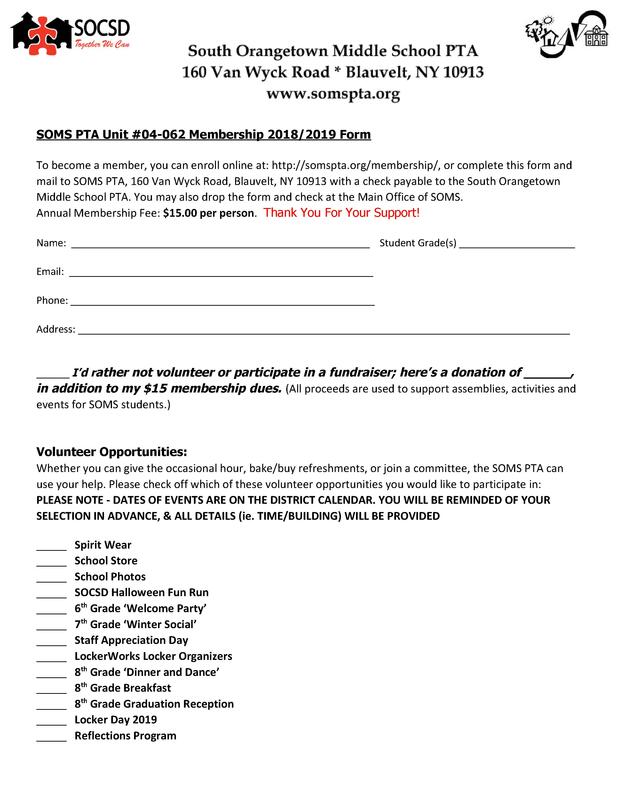 The SOMS PTA welcomes you to join and get involved in the South Orangetown Middle School Parent Teacher Association. Parent involvement in middle school is different, but still very important. Our PTA is an active and vital part of South Orangetown Middle School. We’re fortunate to be involved in many aspects of the students’ educational and social experiences. In addition to fundraising in support of events, activities and assemblies for our middle school students, members of the SOMS PTA participate on staff interview committees, facilitate communication between school and home, and provide assistance wherever we can. Join us by becoming a member and get involved. Why should you join the SOMS PTA? Your SOMS PTA membership dues are used to fund enrichment programs for SOMS students, teachers and parents. Proceeds from SOMS PTA fundraising programs directly support social events, school activities and school assemblies for our middle school students.